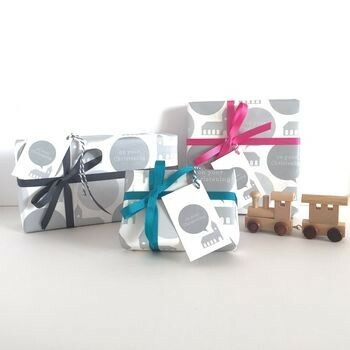 Designed exclusively by us here at The Little Blue Owl, the design of our Christening gift wrap is printed in various shades of metailic silver giving the gift wrap a luxurious feel and look. 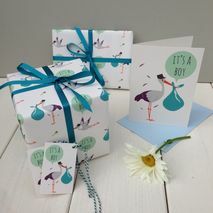 We also offer the option to add matching or contrasting grosgrain ribbon and Christening card. Each sheet is printed on FSC certified paper and it has a smooth matt finish. You can choose to have the sheets of wrapping paper folded or rolled and sent in a postal tube. 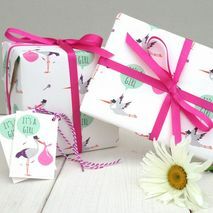 We are so pleased with our brand new luxury christening gift wrap. The contemporary design has a slight shimmer. a set of four sheets with four tags or a set of eight sheets with eight tags. Additional tags and ribbon is also available. The gift tags are 4.5cm x 7.5cm.